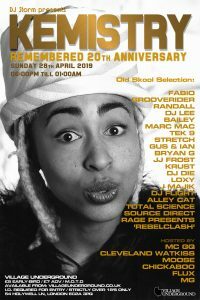 To mark the 20th Anniversary DJ Storm is hosting the last ever Kemistry Remembered. She always said she wanted to make a difference and as DJ Kemistry she certainly did! From Heaven to Dingwall’s to Herbal and 10 yrs ago at Cargo, the line up has pretty much stayed the same with DJs and MCs that meant something very special to DJ Kemistry.